Memories Matter. Never Forget. Those were the words that Holocaust Museum volunteer, Harold “Hal” Wittman spoke to me and asked me to repeat when I visited the Holocaust Museum in May 2014. 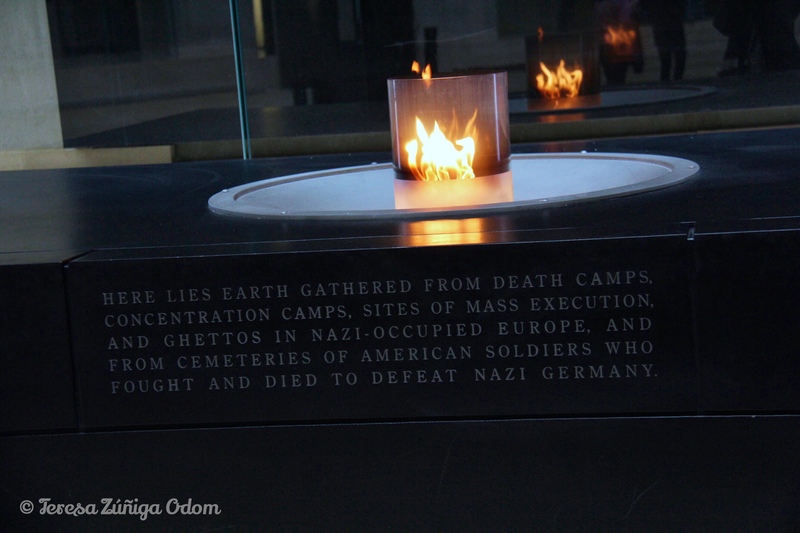 I was in Washington DC for a conference and visiting the National Holocaust Museum was high on my list. I arrived right when the museum opened on my last full day in DC, thinking I would only stay for a short while and then walk on to the Washington monument. Four hours later, I left the museum feeling so saddened by what I had seen there but also determined to share my experience and the words that Hal repeated to me as I was preparing to see the permanent exhibit. When I arrived that morning, there was a Holocaust Survivor scheduled to speak in the auditorium. Volunteers were encouraging people to go and hear the survivor speak so I walked in and an elderly gentleman was seating people. As I walked toward this man, he directed me to a seat and then told me to keep the seat next to me – on the aisle – free for him. He needed quick access on the aisle so I did as he asked. As the program started, he took his seat next to me. We didn’t speak until the presentation was over and I began a conversation with him. I really don’t remember what I said to him but he thanked me later for “taking the initiative to stop and talk.” Hal and I continued talking for quite a while and we shared many stories and opinions during this short time. I talked about Hispanic issues in Alabama and he talked about things to see at the museum that resonated with him. We stood in the auditorium for so long that the moderator for the presentation with the Holocaust survivor joined us. I don’t remember his name but he was a local newscaster and he knew Hal and easily joined into our conversation. Both were very interested in what was happening in Alabama surrounding immigration issues which I wasn’t expecting. After the moderator left and we were walking out of the auditorium together, Hal suddenly stopped, turned to me and said he wanted me to repeat something he was about to say. That’s when he said to me “Memories Matter and Never Forget.” I repeated these words back to him and he smiled at me. It became my mantra that day. Daniel’s Story exhibit – I remember my children reading this book in school. The exhibit is for children and you walk through Daniel’s home and other parts of the story. This is where the words “memory matters” really made sense to me. These words from Deuteronomy are about the responsibility of memory. My visit had come full circle thanks to Hal and the words he asked me to repeat. Later that evening, I called Hal and shared my thoughts on the Holocaust Museum. I told him I wished I could have spent even more time there because there was so much more I wanted to read and learn. He was pleased with what I shared and repeated those very important words again as we finished our conversation. After we hung up, I wondered if Hal had family impacted by this time in history. I’ll never know but as a volunteer for the museum, he was so invested in sharing the story of the Holocaust and making sure that people who visit understand what happened and share their experiences in their corners of the world. I’m forever grateful that I met Hal that day…and I’ll always remember those words he shared…Memories Matter / Never Forget. This entry was posted in National Holocaust Museum, Washington DC and tagged Daniel's Story, Hall of Remembrance, Holocaust Museum, Holocaust Museum Shoe Room, International Holocaust Remembrance Day, Memories Matter, Never Forget, Photography, Washington DC on January 27, 2018 by Southern Señora.